She is coming off a small 2012 Specialize Status 2. Anyone have comparisons or feedback on either? If the Commencal fits you! That would basically mean you are a midget. Their XL is about the size of other brands M.
I was going through the same debate a year ago. I went with the YT. I really like the Commencal on paper (spec, suspension design, look), except they don't make a bike for anyone over 5'6. why the V3? get the V4. I was aiming for the V3 since it is a bit cheaper and the only small available in our budget range. We actually are now looking at the bike with the Marz 380 CR and the Moto C2R rear for $2399. On the website it states it has 5 year warranty. It is for my wife who is 5'4". Sizing also had me wondering about which to get her. I was aiming for a small but from what I have been seeing they run small. 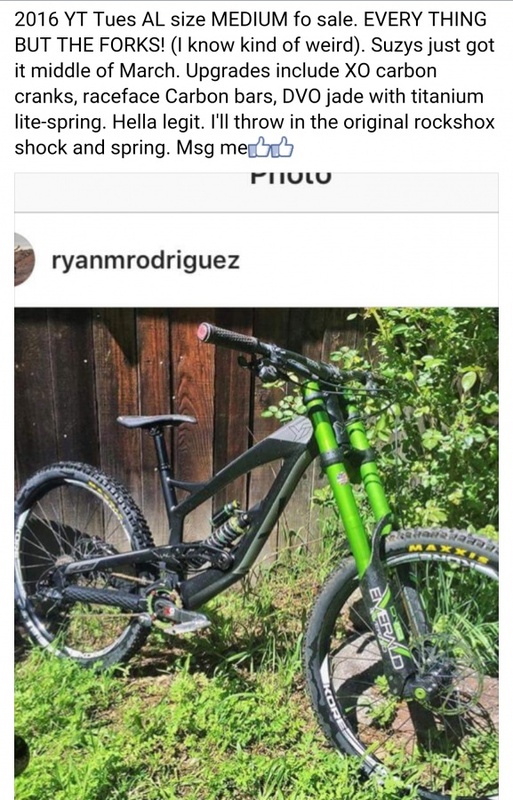 Commencal recommends a small for up 5'7" but was also thinking medium. yeah they are pretty short. The V3 has almost the exact same reach measurements as the Turner DW DHR. I'm 6'1 and just sold my large DHR to get an XL and then got a reach adjust headset to bring it 431mm. So I'm essentially using the XL with headset to bring it up to the size of a large, and even then 431mm is short for a large these days. I like to have shortish bikes though so the 431 suits me well. The warranty is one of the main attractions to Commencal for me, 5 years ain't bad at all on an alu frame these days. As for sizing I'd go with the medium, they indeed tend to run small. Suzy is selling her 2016 YT Tues AL medium. Everything but the DVO forks. Do you know Ryno? If not shoot me a message and I'll connect you. We went with the Commencal Supreme. For the price and for her it was the best option. She won't out ride any bike so the most economical was the best choice. The YT sold out before we could decide so it worked out. Thanks to all the helpers!